Prepare for your One Year Challenge by reading great books, like The Master Plan of Evangelism! For more than forty years this classic study has shown Christians how to minister to the people God brings into their lives. Instead of drawing on the latest popular fad or the newest selling technique, Dr. Robert E. Coleman looks to the Bible to find the answer to the question: What was Christ’s strategy for evangelism? This convenient, portable format has an updated look for a new generation of readers. There’s no conflict between these two: campus ministries are the source of many missionaries. There’s a long history of this sort of thing, and we’re carrying on a proud tradition when we see campuses as the launching pad for worldwide evangelization. Just about every U.S. campus ministry, for example, has a mini-United Nations making up a good portion of its student body. The Next Mass Missionary Movement? In 2011, 100 of those house church leaders made it to Seoul, South Korea, where the Lausanne Movement held a special conference for them. And this fall, about 850 Chinese leaders gathered for their own missions conference even closer to home. 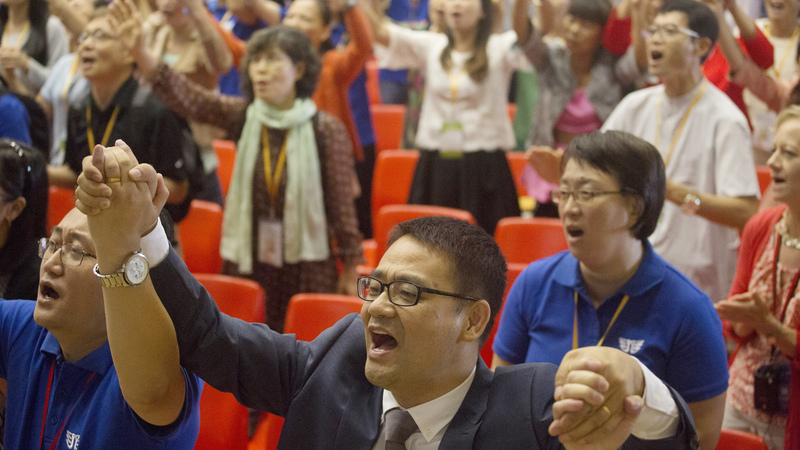 They announced from Hong Kong a long-discussed goal: to send 20,000 missionaries from China by the year 2030. The best place to begin is right where you are. For me, as a student, that meant getting involved where I was on campus. It started with leading a Bible Study in my dorm. As it happened, my Bible study group was a pretty diverse bunch. I began to learn to care for and worship with brothers and sisters from different ethnic backgrounds. My experiences served both as testing and training grounds. But they were by no means exhaustive, they were, as I have said, simply the next step on the journey. They confirmed a growing passion for and desire to make a longer commitment to cross cultural missions. They also exposed areas of weakness and vulnerability, and helped me to better understand the context and organization that would best suit me and help me to grow. Coming to the end of myself in these experiences, I met God in new ways, and I began to understand that if he was calling me, he would and could work in and through me. 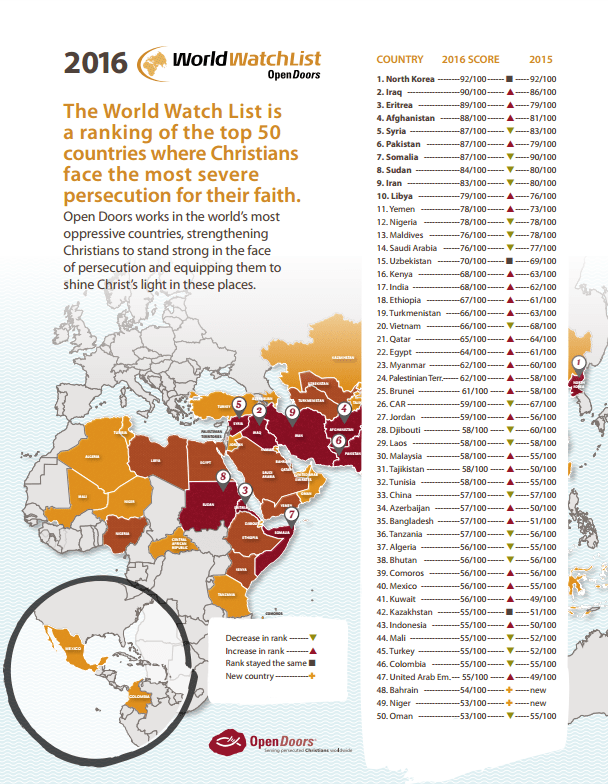 More than 7,000 Christians were killed for their faith last year, up drastically from 4,344 in 2014 and 2,123 in 2013. Those numbers don’t include North Korea or parts of Iraq and Syria, where accurate numbers are hard to obtain, Open Doors said. All three of those countries are among the WWL’s top five persecutors. Read the whole thing, and pray for them. 1. Languages are hard to learn It is very rare to meet a missionary who learned another language later on in life. A foreign language is not an opponent you want to underestimate. It will handicap you for the rest of your ministry unless you take it down early. Facing the challenges of learning a language like Arabic or Japanese is one of the areas that aspiring missionaries by and large give far too little thought to. Med school is no minor obstacle to becoming a doctor, and there’s a reason that most people don’t start med school at 40. The same is true of the missionary’s language school. 2. The early legwork can be brutal Moving to another country is no picnic. 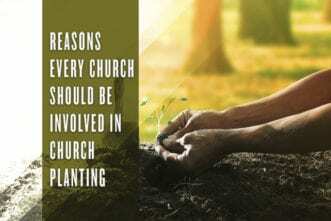 Neither is starting a church from scratch, for that matter. Or adapting to a culture. The hours are long and difficult. You are constantly in uncomfortable situations. As with the languages, this is not to say that a middle-aged person will be unable to do this. For that matter, I’m not aware of any upper age limit for Olympic athletes – the situation sort of resolves itself. 3. There is a steep learning curve It is just going to take you a while to figure out what you’re doing. Even the best of training can do only so much to guide you through the pitfalls and dead-ends of early ministry. Intensive learning is going to have to continue for… well, I don’t know how long. Haven’t reached the peak of the curve yet. Still so steep it looks like a wall in front of me sometimes. Each day the missionary faces the temptation to plateau and give up on learning. The earlier you get to the field, the higher up this curve you will be able to climb. 4. Dumb decisions take a while to undo If you’re not familiar with the roads between you and your destination, it’s wise to leave earlier. On the mission field, you are going to make wrong turns. You are going to get tangled, and it’s going to take a while to undo the blunder. You are going to take some heavy hits, and the longer time you can give yourself to recover, the better. We still wrestle with the consequences of poor decisions we made in our first couple years. And I’m sure the bad choices we make this year will take just as long to straighten out. 5. It will be easier on your family Okay, I don’t have any kids, but this is an educated guess. If your children don’t have strong roots laid in the States or if they are rootless (due to their lack of existing!) then it would certainly seem that they are not going to be stressed much by being uprooted and transplanted to another country. Especially compared to kids in their early teens. I do miraculously have a wife, though. And we were married three months before we moved to China. This was the minimum time that my missionary-trainer would allow. But we found that newly-wedded bliss is an effective treatment for the discomfort of culture shock! Virtually the whole of our married life has been in China, and that has made China all the more happy of a place for us. 6. More time means more ministry Spoiler alert… you are going to die. Sorry if this is the first you’re hearing about this. But the time that we are given to work is limited. And though we have no way of knowing if God will give us so much as one day on the mission field, if you arrive one day earlier you will have one extra day to labor before the last day. Redeem the time. Number your days – they are slipping away from beneath you. Work while it is day – the night is coming, and you will retire. To get specific, the effects of personal discipleship ministry are magnified in direct proportion to the amount of time invested. The most influential thing you can do in China is to teach the Gospel to someone relentlessly for years on end. I suspect that this is one reason that young guys are generally not in a hurry to get to the field – they perceive the essential task of the missionary to be sharing the Gospel with an unbeliever – a task that can be completed in minutes. If they don’t arrive until they’re 43, they’ll still have countless opportunities for evangelism. But if you define the missionary’s essential task as prolonged training of national believers, you are now counting in years, not minutes. And time is of the essence! Multiple generations of church leadership won’t grow up overnight! 7. Giving your youth testifies to the value of the Gospel I regularly have conversations with young Chinese men in the churches here who say something like, ‘I want to make my living in the world first, and then – once I’ve achieved financial stability – I will happily give the rest of my years to God.’ There is something deeply twisted about that thinking. My best years belong to me. I am able to and need to make myself financially self-sufficient. God should be happy with anything that I give to him. But when a young couple leaves their home country, family, and their soon-to-be-grandparents parents and come to settle permanently among a foreign people, this bellows to their audience, ‘Christ is worth your life!’ And that is a message that you want to ring in the ears of young Chinese men. It will give you credibility when you tell them they should give the best years of their lives to God. No life is wasted that is devoted to the Gospel ministry. We couldn’t ask for a more supportive or great to work with partner than Disciples Today! All families need good communication to stay connected. Disciples Today is a key part of the story of many disciples who have taken a One Year Challenge: for many of them, Disciples Today was the first place they learned of this opportunity! Scripture tells us that God has given us “everything we need for life and godliness.” But what makes a Christian godly? In this book, Navigator author Jerry Bridges examines what it means to grow in Christian character. Learn more about the character of God as you grow a deeper relationship with Him. Establish the foundation upon which godly character is built and continue by developing maturity and pursuing holiness.